Aluminum air filter can be used in interior or exterior environments. The aluminum filter is reusable and can be cleaned with steam or hot water spray. Filters meet UL Class 2 flame retardant requirements. Maximum temperature is 240°F. Please Note: This filter is automatically included with your purchase of a VSX unit, designed for exterior application. 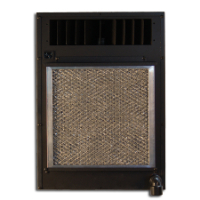 The delivery of the Filter Upgrade is included when ordering the cooling unit. Ordered on it's own, a $35US/60CAN delivery charge will apply if you did not order the Cellar Pro cooling unit from us. If you ordered the Cellar Pro cooling unit from us we'll see if we can do better with the delivery charge, let us know your zip/postal code. Delivery charge is not applicable when filter is ordered at the same time as the cooling unit.